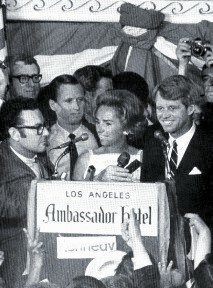 Robert Kennedy was assassinated just after midnight at the Ambassador Hotel in Los Angeles following a victory speech for the California Primary on June 5, 1968. He spoke to an enthusiastic crowd and then exited the stage through a door that led to the hotel service hallway, a short cut to where the press were waiting in the nearby Colonial Room. Ace Security guard Thane Eugene Cesar took the senator’s right elbow and led him through the doors of the hallway into the serving area behind Maitre’d Karl Uecker. When the shots rang out, Uecker grabbed the shooter's arm and pinned him against a steam table, quickly joined by Rosey Grier and Rafer Johnson. Busboy Juan Romero knelt beside Kennedy and him gave rosary beads. He heard RFK ask, "Is everybody all right?" Indeed five other people had been wounded. The first doctor on the scene was Stanley Abo; feeling for a wound, he discovered a hole behind and below Kennedy's right ear. Kennedy was rushed to Central Receiving Hospital eighteen blocks away, but quickly transferred to Good Samaritan Hospital where two additional wounds were discovered. 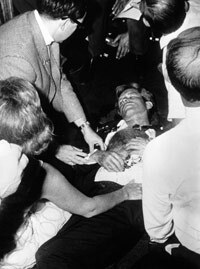 Surgery was performed to remove blood clots and metal fragments from his brain to no avail; Bobby Kennedy died from the effects of an assassin’s bullet the next day. All three television networks (ABC, CBS, and NBC) began coverage at the scene just minutes after the shooting. Audio from reporter in the Ambassador Hotel pantry at the time of the shooting. 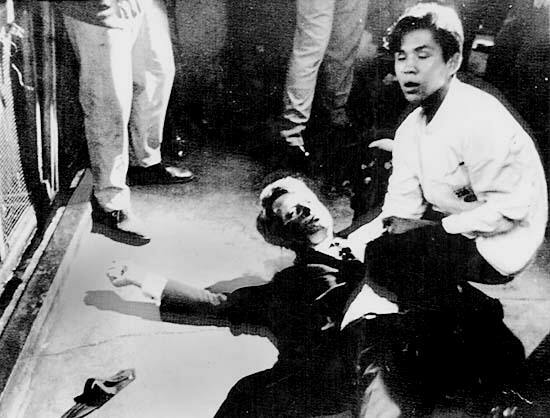 A photograph of Robert Kennedy lying on the floor was immediately televised as reporters announced in voice-overs that he had been shot by an unknown assailant. About two hours after the shooting, additional footage was shown of RFK from behind as he stepped up to the podium and spoke to the crown of supporters. Early on the morning of 6 June, a news conference was held to announce Robert Kennedy's death. His funeral was televised on 7 June. The shooter was later identified as Sirhan Sirhan, a Palestinian born in Jerusalem who had emigrated to the United States when he was twelve. When motive for the shooting was sought, Kennedy's support for Israel in the June 1967 Six-Day War was suggested based upon an article found on Sirhan's person. After Sirhan's arrest, his handwritten personal journals and diaries were discovered. Most of the entries were incoherent and repetitive, yet there was one entry that clearly expressed "RFK must die". However, Sirhan's diary had entries focusing on killing Robert Kennedy dated before Kennedy's support of Israel became public knowledge. Therefore, using the June 1967 Six-Day War as motive seemed hallow. Investigations revealed Sirhan Sirhan was fascinated with the occult, particularly the practice of hypnosis and mind control. Sirhan has always maintained, even under repeated attempts at intensive hypnosis, that he has no memory of the crime. In the 1990s, Sirhan proposed the theory that he had been brainwashed - suggesting he was truly a "Manchurian Candidate". Diary entry: "RFK must die"
Diary entry: "My determination to eliminate RFK is becoming more of an unshakable obsession." What if Robert Kennedy had not been assassinated? How might history have unfolded differently?